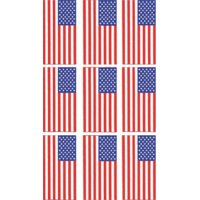 American Flag Decal | Data Graphics Inc. American Flag Decal | Data Graphics Inc.
Are you looking for a high-quality American flag decal? Data Graphics can provide you with a wide variety of different American flag designs in any size or quantity you desire. 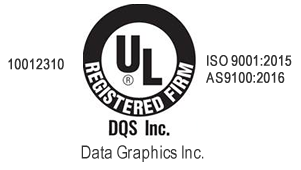 We are in the business of designing and producing high-quality decals, stickers, barcode labels, control-panel overlays, warning signs, hazardous materials placards, product nameplates, and tamper-evident labels. Your American flag decal can be produced on any of our materials, which include paper, vinyl, polyester, Mylar, Lexan, polycarbonate and many others. We can even make an American flag decal out of aluminum for you. While many customers looking for an American flag decal might be primarily interested in a low-cost paper or vinyl decal (which we can certainly handle for you), some customers might be looking to attach an American flag decal on the product that they manufacture and desire it remain attached for the life of that product. For certain products, our paper decals can be expected to proudly display Old Glory for years, but some of our customers manufacture products that do their work in extreme heat and/or cold. Some need to function in environments where chemical corrosion or abrasives are common, while others must weather exposure to the fading effects of solar radiation or the corrosive effects of saltwater contact. Some of our customers are military and aerospace contractors, so we have experience producing custom labels and decals that can handle the harshest working conditions for their products, too. We are confident that our three decades of experience in this field will enable us to design and produce American flag decals you will be proud to attach to your hardware, your products, your packaging, or however else you decide to display them. Our production capabilities and technologies make no order too large or too small for us to handle. We can produce an attractive American flag decal for you, depending on the material you choose, on sheets or rolls, whichever best suits your needs. Our Mount Dora, Florida, production facility is conveniently located outside of the Orlando metropolitan area, and is always open for prospective clients to tour. We offer rapid two to ten day turn-around on most orders. Stock American flag decals tend to be a fast and simple set-up process for us because we have produced so many attractive and patriotic decals for so many customers over the years. Call to speak with one of our friendly customer service professionals, and discover the best materials, adhesives, and processes for your American flag decals. Let them know if you have a special custom design in mind, incorporating the American flag. 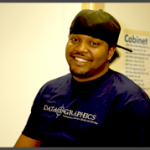 Decal design and production is our specialty. We look forward to hearing from you.